1. Drink a cup of warm water. Take small slow sips. 2. Then take 2 green apples with the skin- yes on an empty stomach. OK, if you are too lazy to bite, then you can blend the apples and take both the fiber and the juice together. 3. Drink another glass of warm water. 4. Then only brush your teeth. Give it about at least 30 min before taking your breakfast. 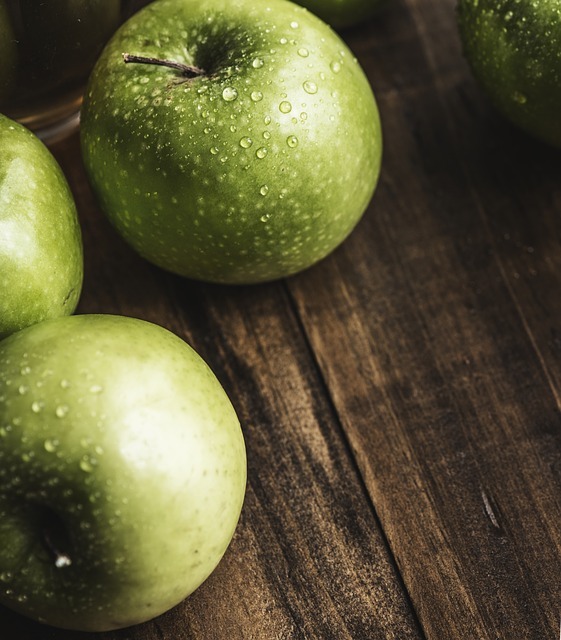 The green apples should be soaked overnight in salt water to remove wax and chemicals on the skin (actually 2 hours will do but you can also soak it overnight). Other alternatives: red apples, oranges, grapefruit, vegetables like carrot and yam. Following fruits are not advisable first thing in the morning: watermelon (too cooling for the body), bananas (may cause gas), pineapples. Your digestive track is working all the time. During the time you sleep, good and bad bacteria work on the food that you eat and produce all types of chemicals, including gases and toxins. That’s why when you get up in the morning, you notice your breath will always stink. Imagine your digestive track has so much of residue leftovers (some from rotted food) and if you take your normal breakfast- coffee with egg mayo sandwich for instance, the greasy and acidic stuff, going through your digestive track (that still has lots of residual food stuck in the linings). Eventually, your digestive track will be so taxed -and that’s when you start developing stomach problems. By taking apples or other fruits on an empty stomach first thing in the morning, you clean up your digestive track. Fibre act like a broom to sweep and brush away food residuals along your intenstine track. Drinking water helps to move the ‘broom’ along your digestive tracks. If you follow the recommendated steps above, you will find that your stomach problems would go away. Your energy levels will be increased as your digestive system is able to work more effectively (your entire body system is very much interlinked). This article is part of the Stomach Ailments Series. Why do we need to drink water & take 2 green apples before brushing out teeth? Why cant drink it after brush the teeth? Good question- brushing teeth kills off the good bacteria. Furthermore, toothpaste also contain chemicals since it is manufactured. First thing in the morning, your stomach is empty, so it will absorb anything- it is safer for it to absorb natural occuring substance and microorganisms in your mouth than chemicals. I’ve drink water on empty stomach before brushing my teeth and my digestive problems have reduced- they only come back when I don’t take care of what i am eating.